As the B-52s continue to take their party-music revolution into the 21st century they show no signs of slowing down! It has been said that the B-52s are as quintessentially American as the Beach Boys. And forty years and over twenty million albums into their career, the B-52s remain the among the most beloved rock stars ever, and you're invited to celebrate their 40th Anniversary with them! From the timeless gems of "Rock Lobster," "Planet Claire" and "Private Idaho" to the more recent classics of "Channel Z," "Love Shack" and "Roam", the B-52s unforgettable dance-rock tunes start a party every time the music begins. Any mystery concerning the longevity and ongoing appeal of the B-52s is immediately solved when exposed to the B-52s unique concert experience! Sound good to you? 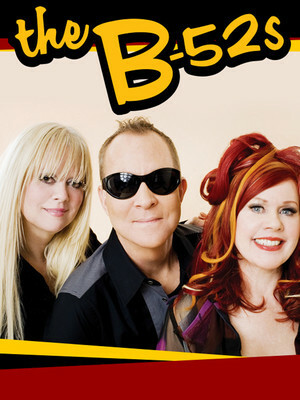 Share this page on social media and let your friends know about The B-52s at Mann Center For The Performing Arts. Please note: The term Mann Center For The Performing Arts and/or The B-52s as well as all associated graphics, logos, and/or other trademarks, tradenames or copyrights are the property of the Mann Center For The Performing Arts and/or The B-52s and are used herein for factual descriptive purposes only. We are in no way associated with or authorized by the Mann Center For The Performing Arts and/or The B-52s and neither that entity nor any of its affiliates have licensed or endorsed us to sell tickets, goods and or services in conjunction with their events.